Since 2005, infotex has been developing a SIEM meant for small community-based financial institutions and other small organizations. If you’ve been searching for a SIEM, you know there are as many ways to define “SIEM” as there are SIEM developers. 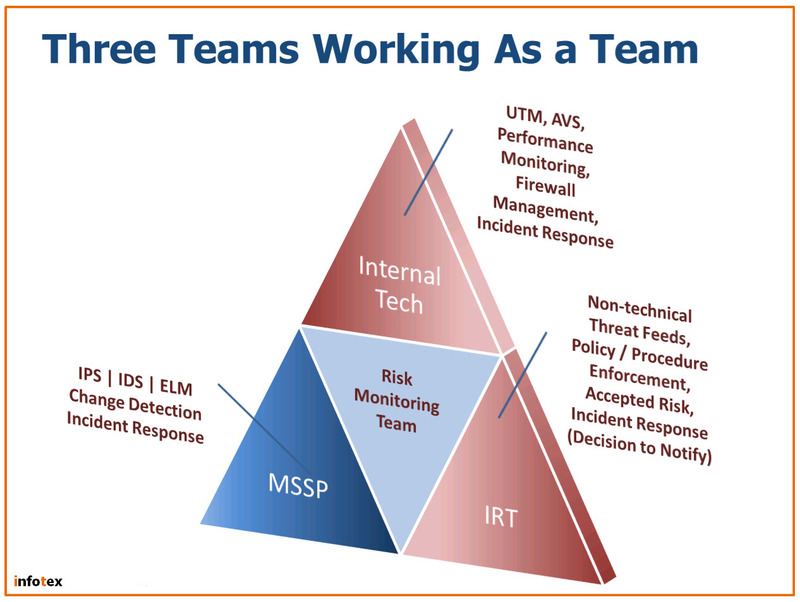 At infotex, we define a SIEM as the place where three teams can assemble as one team: the Internal Technical Team, the Incident Response Team, and the Network Monitoring Team (which in our case is infotex, the MSSP.) Our SIEM cross-checks threat intelligence with real-time data from the network, your internal team, and the community. The SIEM assists in coordinating the proactive and reactive activities of the three teams, while correlating views into information created by the three teams. Our Clients can attest to the customized nature of our approach, where the SIEM and its reporting function is customized to meet the needs of YOUR internal technical team, YOUR incident response team, and YOUR unique network. For example . . .
Once all three teams are trained, the SIEM helps us fulfill the role of being the Cybersecurity Expert on your team. While ensuring compliance (our system helps you comply with over 25 cybersecurity assessment tool statements on day one), we also ensure appropriate education. Our custom approach will eventually help you manage both the proactive and the reactive activities of all three teams, with the mission of monitoring risk. Our approach teaches your team incident response fundamentals, and ensures that your management team is in a positio n where, when that career-threatening event does occur, you can turn a lemon into lemonade. 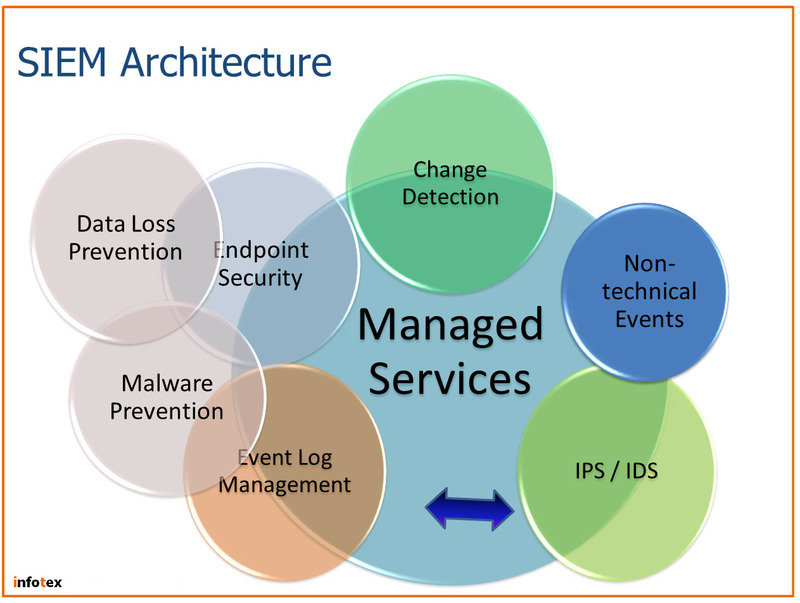 Our SIEM architecture leverages an IPS/IDS system that has been tuned since the year 2000, and our event log management system was originally introduced in December 2004. But what’s most important about our SIEM is not that we give you a flashy portal to view our reports. It’s not that we provide reports that allow you to drill-down in real time on data that helps articulate the current state of your network. It’s not the change detection process we’ve been providing our Clients since 2007, and that was required as the third baseline statement in the FFIEC’s 2015 Cybersecurity Assessment Tool’s third domain. What’s important is not even the fact that our system helps you comply with over 25 CAT statements on day one. It’s the fact that we bring in input from YOUR team and YOUR reports to match up with what we see when we are monitoring event logs and network traffic on YOUR network. It’s the fact that we see both the non-technical and the technical aspects of incident response as being equally important, and we then follow-through with our SIEM. So why not ask for a demo? Because our product is so customized, we strongly feel our demo should be customized. Our demos actually start the discovery phase so we can quickly provide a customized proposal. Our demos are with engineers, not salespersons. We will not only show you our system, but we can help you understand how it will assist you in an incident, as well as preparing for the incident itself. Our goal is that when you request a demo, within a week after the demo you will not only have a great idea as to how we can watch your back, but you’ll also know what it will cost!